Ford Endeavour is India’s most powerful SUV of its segment. Ford made headlines by using a powerful 3.2L, five cylinder engine that is good for close to 200 HP and 470 NM of massive torque. When coupled with standard four wheel drive and driving modes, it has the ability to take the passengers comfortably on all terrains. They even offer a more city friendly variant with 2.2L, four cylinder engine producing around 160 HP and 385 Nm of torque. This one returns an impressive 12.62 kmpl of mileage. A clean 225mm of ground clearance makes Ford Endeavour a great option for every adventure. 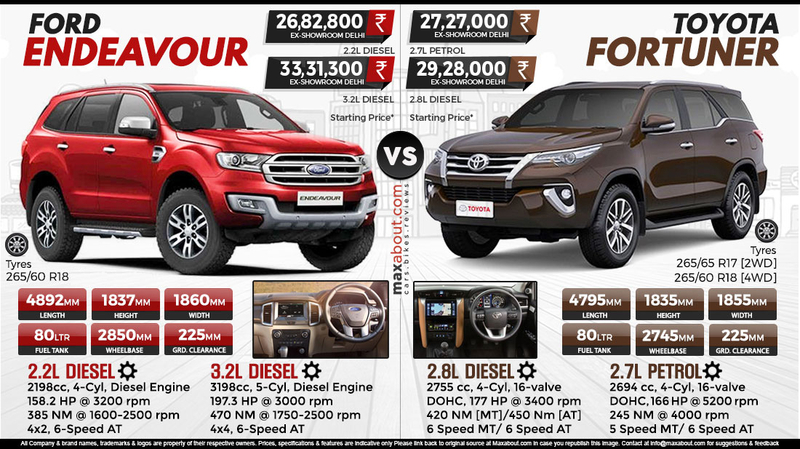 Toyota Fortuner is its closest rival. It even offers a powerful 2.8L, four cylinder engine producing 177 HP and 450 NM of torque. The engine returns 12.9 kmpl of mileage. Ground clearance remains identical to Endeavour while fuel tank on use is also same in both SUVs at 80 liters. Both cars are available with all wheel drive and two wheel drive option while 6-speed automatic gearbox can also be selected among different variants. Ford Endeavour offers around 100 mm of more wheelbase than Fortuner and not just that, it measures more in terms of length, width and height. The interiors of Endeavour are also years ahead of Fortuner.